Burning red suns fall across a land of sand, colour and burgeoning hearts, where wild creatures tall as trees roam freely, the lion awaits, an oasis brings rest and peace, and the stars glow brightly in an ink-black sky. You are swallowed into another portal of culture – mesmerised by the colours of the world transforming before your eyes. A horizon of pure gold. Words apt to describe this place might be Wisdom, Peace, or perhaps Serendipity, for my coming to this land wasn’t foreseen, and yet, perfectly place in a journey changing from green to gold, from the Tropics to the Sahel. Many dreams became their first reality. This land has left me rich with treasures beyond imagination. This was surely a meeting with a Wise Soul – she’d seen many things in her years between invasions, slave trades, rising rebellions and prophets, yet had found a peace with her past, ushering in this stranger with open heart, open arms, open shores. For the real word for this land is Teranga – local for hospitality. These people pride themselves on it. You’ll never find yourself alone in the cold here. I found a slower pace of life on her long, tranquil coastlines. A chance to absorb and exhale, hypnotise and hallucinate another fantasy to life. This land is Senegal, of course ~ once the westernmost point of the known world before the discovery of the Americas ~ the ‘Old World’. It has been a whole new landscape and geography for me to explore. Here, a strong blend of cultures from sub-saharan Africa and the Arab World come together to form a rich and varied land. I arrived in the dense heat of the dry season when the earth was yellowed and bare, with sparse plant life, only to see it burst into Eden-like vivacity with the ensuing rains – a landscape transformed dramatically before my eyes. My month stay in Senegal was an education in the power of seasons, earth, family and oasis. This land showed me that things must first die… to be reborn even more beautifully. It was a long journey travelling up the coast in sweltering heat, using only the cheapest public transport (minus horse and cart perhaps) and the help of many locals who always seemed more than happy to help – help me buy a local simcard, find toilets (European bladders do not match the stamina of African ones), gave me information on what to see, where to stay, sometimes insisted on paying for our share of taxi rides etc. Locals are always the best guides, and I found the people of Senegal refreshingly unintrusive, which may be in part to do with my crap French, and the respect people seem to have for foreign travellers here. Tourism in this part of the world is quite different from countries in SE Asia for example. I only met a handful of europeans – mostly volunteers in groups or more seasoned travellers returning to a favourite hotel or to see friends. Hardly anything you see along the road is tailored for ‘tourists’ here. Everybody I met was kind and welcoming and I wasn’t once (that I can remember) pestered or hawked beyond comfort, not even in busy markets. Crossing the river with the help of local chap, in southern Senegal. Sitting by the side of the river under temporary grass shelters with local sellers eating fresh coconut whilst waiting for the ferry to arrive – that’s a memory of peace for me, and one of my favourite parts of this kind of travel. We all had to cross – there seemed to be no division between we travellers and locals. A respect and an ease of being. We didn’t want anything of each other, just to share the air, the moment and the universal power of smiles. This place became my home, its residents my family. Colourful birds, butterflies, lizards and chameleons climb amongst the banana trees, aloes and great swathes of flowers. Every inch of the thoughtfully-designed hotel reminds you that Begue Pokai is family – a place for travellers and friends to come together. A place of community – come here to unwind and connect (quite literally – here was the first EVER good wifi connection I’ve found in West Africa). The people I met here, the dinners we shared, the love and heart – my perfect oasis after weeks of travelling through rural parts of West Africa. At the table we spoke a mixture of Italian, French, Spanish and English – no boundaries or prejudice. That’s my kind of cocktail. Ana from Barcelona will read your stars, Stephanie is the kindest host you’ve met on the earth, the Italian ladies are busy in the kitchen ~ the coffee’s always hot and the fish always fresh from the sea. The village thrives on the edge of the Atlantic Ocean. The sandy streets make way for horse and cart, busy markets stalls and passing buses. People watch you from the steps of their homes, children run out to hold your hand as you pass ~ the sun dances along the coast, changing colour as the season matures. Stayed long enough to get some kind of henna before I left though, with a female friend of mine… turns out they were preparing us for marriage. Nice try, ladies! I’m not giving in that easily. On days I wanted to be alone I took myself off for walks through the barren landscapes around the town, trying to find signs of nature. As you can see, the rains had not yet come, but they were on the brink. I chose to avoid the chaos of Dakar – a personal preference – but rather than miss out on the chance to explore Senegalese marketplaces I headed to Rufisque, a city on the suburbs. A once-thriving port populated by a mix of European architecture; I found its streets and its people a bustling myriad of fascinating culture. It is a poor commune of Senegal, neglected by failed industries. Yet I found its humble people more welcoming than in any rich part of the world I’ve been to. I was invited into people’s homes, fed good food, given clothes, the usual tours of the neighbourhood, rides on horses, and plenty of warm, loving heart. It is always the simple or free things in life that make the most enchanting and memorable gifts. I have a lot to learn from these people. With Muslim child, Rufisque, Dakar, Senegal. The voice of God can be found amongst the highest mountains, and between the smallest grains of sand… if you only have the ears to hear it. The essence of a pilgrimage is to move, yet, at some point along the way, you realise you do not move at all ~ the pilgrimage moves you. my global pilgrimage finally brought me my first dance with the desert. I’m not sure the desert can really be described as a landscape or place – more like an element. A whole new element your wide eyes have never beheld. Perhaps I know now how people feel when they first see the sea ~ for my eyes were lost in those deep and ever-stretching waves. Yet here, I did not swim. Ever ran through the desert as fast as your feet can take you? Your heart pounds, you head rushing as you sprint up the highest dunes, your feet getting lost in deep, powdery sand – gold like the sun – heat burning down through misted sky. Your kingdom come. Your heart knows this is not merely a place to pass through – this is your destination. Now, here, you have arrived. Here, you have the excuse, the strength, to just be… nothing. All that you are, all that you are not. Thoughts of becoming vanish entirely. As you approach the north of Senegal the landscape begins to change, ever-more arid – pockets of desert come up, and eventually you reach the greatness of Sahara. The Lompoul Desert is the first corner of desert to greet you. I travelled across on camel-back with the help of local people and chose to stay at Ecolodge de Lompoul. Ecolodge de Lompoul offers luxury tents on an authentic, unpretentious camp at the edge of the desert among the dappled shade of some of the desert’s only trees. 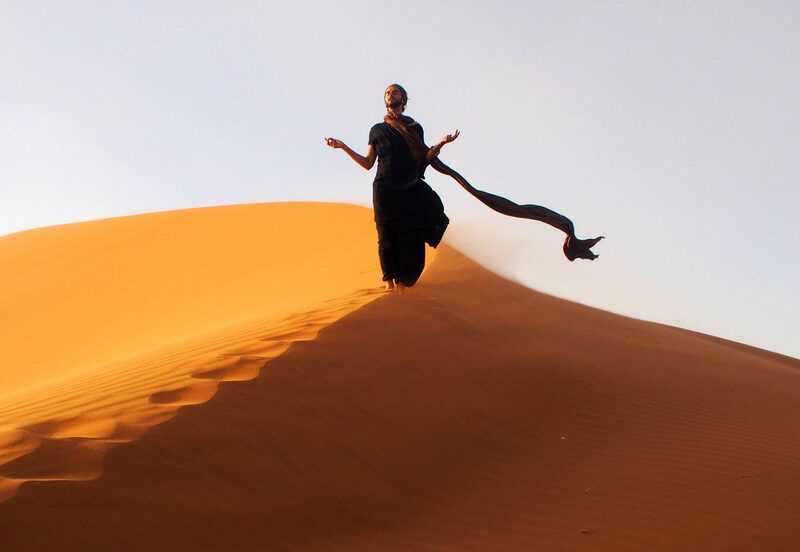 I danced at night with a bedouin band, chased the setting sun barefoot, and lay flat on my back across the highest dunes facing the swirling skies above, hypnotised and stilled, before forward-rolling all the way down to the bottom in childish hysteria. I connected to a simple and pure energy. I wasn’t interested in taking a 4×4 raging across dunes. I prefer to mold to a landscape and a people. Local food, relaxed, authentic settings, colourful fabrics and textiles, and warm heart from the staff and family who live there ~ my every need was taken care of. As with the rest of Senegal, I fell very easy into the way of life here, and with the local people. The desert will never leave me – even my camera still has grains of its sand in every corner and gap. A camera which has survived sand of desert and rain of jungle, and still lives to tell another story. A loyal companion. Somebody once mentioned they thought of me as a “whimsical gypsy prince”… Well, the desert of Lompoul might just agree with that person. Time for me feels like a spiral, a coil narrowing at the tip, and as we get closer to the middle, to our Maker, time is speeding up. My life is already flashing before me and I’m still trying to live it for the first time. Somebody recently asked me how old I was and I can honestly say I was unsure, had to start counting down the years to my birth on my fingers. I’m not lying! Too much happens to me!! You will never know. I’m in one place, feeling so much, feeling a whole universe of depth and emotion, feeling so constant and present and connected to this leg of my life, to the task at hand, as if nothing else came before and nothing will come after, and then, suddenly, I am gone again… gone again down that long dark passage of memory, looking back at this time which now feels simply like a dream, a drug I took, or a story I once heard. I have pictures, many of them, but even they seem somehow fabricated, props in this stage version of my life. Already it is approaching 2017 and I feel like I’m just getting started with 2016! And so it was with Lompoul. One minute I’m laying in the sand, in silence for many hours, looking back at the white tents of the camp, wondering if I should just stay forever. Then suddenly, somehow, I am gone again… I am gone again. Time no longer seems to be passing in the ‘usual’ way. She made you a promise. You know she will keep it… she’s that kind of girl. I’ve never been one for one night stands anyway… leaves no room for heartbreak. I am going backwards in time with your blogs, having started with the recent 2018 sands of time. But each one fills me with hope and a deep love for the Earth, now that I am getting acquainted with some of her totally different facets. Your analogy of the desert with the love of your life was simply beautiful….whether a trip to Senegal materializes or not we can travel through your blogs….as many times as we wish. Beautiful… I am so happy to ‘sow the seeds’ in ways you describe. Really glad you are reading back through my diary… there is a lot of journeying, here and there, and much more to come. ..More than I even know or can foresee. I am thrilled that Africa has become part of your horizon! Africa will always have a very special and deep place in my heart. It has undoubtedly changed my view of the world and its people. Speaking French would make a trip through West and Northern Africa so much easier and whilst not being fluent myself, I learnt pretty well as I went along 😉 …like I do with most things. Amazing that you spent part of your childhood in Zambia – it is not just through the eyes of a child, I can assure you – the vegetation can be enormous in Africa. Thank you very much, Douglas. It it such a pleasure to share my story with appreciative people. Wishing you all the best for the rest of 2018. James. What a glorious post! Filled with beauty and poetry. I am doing some traveling this summer. This is such an inspiring travel post! Oh wonderful! Wishing you every blessing for your journey ahead. Genius article! Superb photos! Bravo! Making me think of adding Africa on my travel list, even though I haven’t thought about it so far! Interesting experience and wonderfully written! Thank you so much for a fun way to start my day! Beautiful pictures and powerful words of adventure and openness of heart and soul. I miss the draw and mystery of the desert (I was in Morocco’s in April 2016). What your eyes saw touched me and was captured magnificently through the camera’s lens. Thank you for sharing. Wow, that was amazing post. Wonderful collection of photos! Looking forward to seeing more of your work in 2017! I just found YOU! It was a wonderful read and your pics are stunning. The way you describe Sénégal was unique, Chapeau! What a vivid content, lots of effort has been put into that’s for sure. And I thought I can photograph…lol. I am lost in your photos…..so I can imagine how you would have felt lost in the desert. Looks like it was an insightful and inspiring trip. Thank you! Gosh, it was my pleasure to come to India. I cannot wait to get back… lots more I’d like to see on the Sub-continent… Peace. Namaste. Looking forward to more of it ! I’m really flattered by your response. Welcome. And do keep posting amazing stuffs !! Thank you too… must have been a fascinating place to grow up. I look forward to the day my feet land on Kenyan soil… God bless you. Your photographs are stunning. Visual poetry. Would you mind going through my blogs though I am just a beginner…. I am having some issues putting up the face actually… My server’s got some problem…. Beautifully, beautifully written and presented. It has ignited an interest in exploring a country I hadn’t thought of! Africa is rising and I love the perspective you have shared. Thank you, James. And it belongs to a hairy person! haha. those feet find their way into many places… all good ones. Thanks for reading! I re-read your post few times, it is really amazing. Great job! Thank you dear friend! :). this is amazing! you get a like and a follow. A humbling, exciting and enticing tour de force – bravo, my dear! These pictures are so nice, they actually make me feel like I’m there. That’s such a compliment, thank you. Such poetic expansiveness, in your writing and photos. Thank you for shining a light on the people and landscapes in this corner of Africa. Blessings and joy for 2017. Thank you, Amit. It’s good to hear from you my fellow pilgrim, as always. I hope you are well and I hope 2017 brings you light, success and healing for your coming journeys, whether inward or out. Blessings returned my friend. What an absolutely incredible photo tour of your journey — thanks so much for sharing! Thanks for the great pictures. I feel like I just went on a trip and visited Senegal myself. Beautiful pictures and what a gorgeous place!!!! Stunning … love the seduction of the desert … such an intimate reflection of your journey … love this: We all had to cross – there seemed to be no division between we travellers and locals. A respect and an ease of being. You are so welcome, thank you so much for the beautiful comment. 2017… bring it on! Un carnet de voyage magique ! The way you describe the journey is extraordinary. Eagerly waiting for the next blog! What a wonderful series of images! This is such a beautiful place. Your photos make me wanna visit this place one day! Thank you. I really hope you get the chance! Indeed I am… Thank you for commenting. Oh Monika I am truly flattered. I wish you all the best on your new journey. Stunning photographs and descriptions. Senegal may have just crept onto my list of “must visit” countries. Thank you, Shaun. I hope you make it some day… anon! Welcome to the Realm . Thank you so Much! Haha the first one to welcome me here. I Really appreciated it. Great pictures! Wonderful post!Thank you! Oh you are so welcome. Love your writing! Thank you so deeply for this comment. May all our minds be open. There are many colours in this world. As always, your images and story telling are first rate. I have been to Senegal twice and you brought back to my mind the sights and smells and the incredible people. Thank you! Beautiful encounters with the people. Do you ever grow weary of travel or is it truly your calling and purpose in life? Thank you. Thank you for this post, very nice to take a break from work and be inspired by your journey. Thank you, sir. The pleasure is truly all mine. I truly hope so too. 🙂 Have a New Year full of wonder, wander and magic!!! p.s. thanks for following me on Instagram. Now I’ve found yours. And I thank you for following me. Thank you! You are truly welcome. Simply stunning. Thank you for sharing such grace – on all levels. You are welcome. Thank YOU, my friend. What a beautiful trip. I can see why you thought of that place as home. And…yes, I’ve found that sort of openness and generosity in India; it makes you just want to linger and stay for ever. Interested to read of the exorcism, too. I witnessed one in Libya, many years ago, where the priest was beating on the poor fellow’s back with his fists to drive out an evil spirit. He definitely have, James. Thanks. A mesmerising journey to a magic land of beautiful people. A magic land indeed… Thank you. Transcending… magic… a beautiful journey. Beautiful photos, story and journey, as always. I am just mesmerised by these images and the way you tell your story. Inspired, as always. Merry Christmas to you James. I am so glad to read your words. Thank you. Merry Christmas and all the best. An extraordinary journey. Great pictures and words, looks and sounds sensational. Wonderful. Thank you, Brenda! Wishing you the best of all the universe. Magical memoir. Sending blessings your way and wishing you a wonderful 2017! Thank you, Denise. Wishing you all the best for a magical new year.